OnePlus had launched the OnePlus 6 smartphone in India last month, along with it they had also launched the OnePlus 6 Marvel Avengers Limited Edition smartphone in India. As promised, from today OnePlus has started selling the new OnePlus 6 Midnight Black with 8GB RAM and 256 storage version in India exclusively on Amazon.in for Rs. 43,999. The company said that the OnePlus 6 256 GB variant has become a community favorite in a short time and has been met with unprecedented popularity both globally and in India. If, you are planning to buy this OPPO smartphone, here you can recall the specifications. It sports a 6.28-inch Optic AMOLED display with a notch, 84% screen-to-body ratio and is protected by Corning Gorilla Glass 5. It is powered by Snapdragon 845 Mobile Platform with up to 8GB of RAM, 256GB storage version and runs on Android 8.1 (Oreo) with OxygenOS 5.1. It has a fingerprint sensor on the back of phone which is in stylish oval shape. It also comes with face unlock feature that can unlock the phone in 0.4 seconds. The OnePlus 6 Midnight Black also has a glass back, but with matte finish. OnePlus has confirmed that it has daily water resistance, by using a special type of foam layered on the gap between the screen and the battery cover that prevents water from seeping into the wiring. Along with that the waterproof materials in the headphone jack and fingerprint scanner, and silicone loops in gaps around the buttons of the device also makes it daily water resistance device. Although it can survive a drop in the water, rain or spilled water sink, rain or a spilled glass of water, but do not go for swimming with it. It has dual rear camera the primary is a 16 MP with Sony IMX519 sensor, f/1.7 aperture, OIS as well as EIS, the secondary is 20 MP with Sony IMX376K sensor and f/1.7 aperture, for portrait shots and 2x zoom. On the front side it has 16 MP camera with Sony IMX 371 sensor. While the company has promised that user will be able to take portrait mode using the front camera through software update. The mobile sports a 6.28-inch Full HD+ 19:9 aspect ratio AMOLED display with DCI-P3 color gamut, Corning Gorilla Glass 5 protection with a resolution of 2280 × 1080 pixels. It is powered by 2.8GHz Octa-Core Qualcomm Snapdragon 845 10nm Mobile Platform with Adreno 630 GPU and runs on Android 8.1 (Oreo) with OxygenOS 5.1. The device comes with 8GB LPDDR4X RAM and 256GB (UFS 2.1) storage. On the front side it has 16MP front-facing camera with Sony IMX 371 sensor, f/2.0 aperture, 1.0μm pixel size. The mobile supports 4G VoLTE, WiFi 802.11 ac (2.4GHz + 5GHz), Bluetooth 5, GPS + GLONASS, USB Type-C. It has 3.5mm audio jack and Dual SIM (nano + nano). It also has a fingerprint sensor on the back of phone and comes with Face Unlock feature. The mobile packs 3300mAh battery with Dash Charge (5V – 4A) with fast charging, it has a size measurement of 155.7×75.35×7.75mm and weight is 177g. 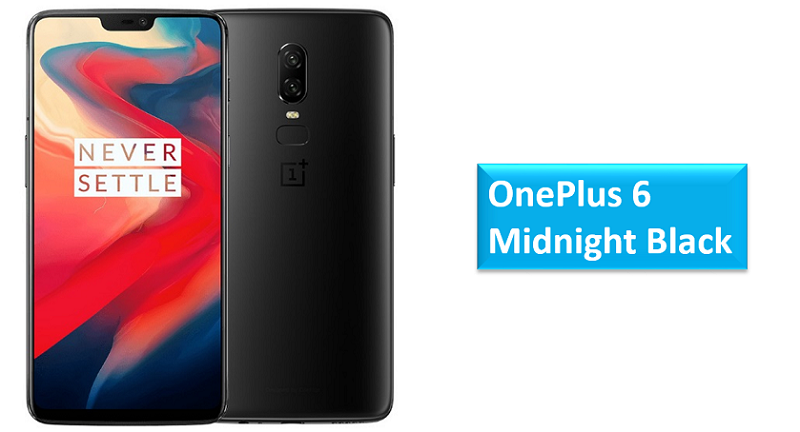 The OnePlus 6 8GB RAM with 256GB version in Midnight Black is priced at Rs. 43,399. It will be available exclusively Amazon.in from today. Share us your views on the OnePlus 6 Midnight Black smartphone in the comments section below.